So we all want to ride like the pros in the Tour de France. Unfortunately if we try to train like the pros we tend to break down very quickly as we’re simply not ready for it. We’ve used our experience of how cycling injuries come about. We’ve combined our experience with knowledge of the most important muscles in cycling. Now we bring you our ultimate guide to cycling performance and injury avoidance. First comes the non-optimal movement pattern. Then comes the loss of performance. Then comes the injury. Implement our training plan here and you’ll hugely reduce your risk of injury and improve your performance as a bonus! Before we move onto the fun exercise stuff to make you a more amazing cyclist I wanted to cover a couple of points that take zero effort to implement. In fact they can actually save you a lot of effort and make you a better cyclist in the long run. Firstly don’t increase your training load too soon. The human body is incredibly adaptable but it does need time to adjust to changes in demand. If you have something you’re aiming for work up to it gradually. Have a look online for a training schedule appropriate for your current level that goes to where you want to get to. I pretty much say this in every article I write. But it is THE most common cause of injury. Too much too soon. Secondly I’d recommend all cyclists to cross train. For those that haven’t heard that term before it simply means training that isn’t cycling. Cycling is a great exercise and doesn’t load up your joints too much. Which is what attracts a lot of people to the sport in the first place. But, our understanding is changing. We speak a lot about How Running Is NOT Bad For Your Joints in our previous article we’ve linked to. Perversely this potentially means cycling could be bad for you joints! The reason being is that more recent research suggests that impact is good for our joints and promotes good joint and bone health. This is backed up by many studies which show reduced bone density in cyclists. Making them more susceptible to osteoporosis. This can be a real problem for the elite guys and gals who don’t tend to do that much cross training for fear of getting injured. With Olympic medals on the line I can understand that. But for the rest of us a more balanced approach to training can only be a good thing. What ‘cross’ training would I recommend. Well anything that you enjoy really. If you enjoy it you’re more likely to do it. Preferably something that is weight bearing – although swimming will help with mobility issues cyclists often have. Dare I say even a bit of running? Pilates and yoga can be an excellent adjunct to cycling training. So here’s our best advice on how not only to avoid injury but hopefully enhance your performance too. It’s based on knowledge we’ve accumulated over our 14 years of practice treating cyclists. There are some very consistent movement patterns we see. More so than any other sport that comes to mind. The exercises are designed to be done in the order they appear here for maximum benefit. Quite a bit of thought has gone into this. As a general point stretching, or any of these exercises, should not hurt! If they do they will have the opposite of the desired effect. If you’re stretching to pain try stretching a bit easier so it doesn’t. If one of the exercises hurts try an easier variation so that it doesn’t. If everything just hurts click the Book Now button top right! Consistently we trace cyclists injuries back to their dodgy posture. Whether that’s sitting at home on the sofa or in the office or actually sitting on the bike. Many cyclists simply don’t know how to sit. Which is ironic when you can be doing upwards of 5 hour rides. Cycling fundamentally shortens the hip flexor muscles because of being in that streamline position for hours on end. This causes a knock on effect throughout the body in terms of efficient mechanics. It’s one thing to recognise this. It’s another to do something about it. Few cyclists do and so this gives you an advantage – not that I’m trying to appeal to you competitive cycling types or anything. This will inhibit the muscles that extend your legs backwards and generate all of the power in your pedal stroke. Simply making you less strong and more prone to injury. This is why we focus on opening and optimising the length of the hip flexors before we consider the muscles the do the opposite movement – the glutes. The movement we want to encourage is the opposite of sitting in a saddle. We want to open up the pelvis and allow room for the muscles to work efficiently to propel you across the tarmac. Movements like the Cobra exercise in Yoga for example. We have a few favourite exercises to achieve this also. Try Cobra first though and progress onto our 2 exercises. If you get any pain you’ll need to come see us before using these exercises to maintain the treatment. This first video was initially done for office workers sitting down all day long. You can see how it’s easily adaptable to cyclists sitting in the saddle all day long. Apart from getting off for the obligatory mid ride cake of course. The exercise above maybe tricky to do if you don’t have a bed, Swiss ball or massage couch to hand. Here’s one you can do pretty much anywhere. It’s a nice variation anyway as you can make it hit different muscles fibres using the position of your hands as demonstrated in this video. So you should be as loose as a goose now and ready for action. If you have a power watt meter try putting this to the test. See what wattage you can get up before doing these stretches and then try again after. There are lots of variables here but just try and get a sense of how easy things feel. Let me know how you get on in the comments below. 2. Spines Can Rotate Too! Continuing the theme the next one is designed to help the overall stiffness you can get after long periods on a bike. This one will not only help stiff lower or mid back issues but potentially help the standard tight hamstrings all cyclists have. Potentially shoulder issues which in turn affect symptoms down the arm. Pelvis positioning is surprisingly bad in all but the most elite cyclist. Cyclists just don’t know what to do with their pelvi (I’m assuming this is plural of pelvis despite what spell checker says!) I’ve not been to a cyclists weddings but I’m picturing a stiff looking dance floor and a strong desire for me to hand out lots of business cards. Anecdotally consider someone towards the end of a ride who you’re catching up on. You have a sense you just know they’re struggling. Chances are it’s the fact their pelvis is wobbling around all over the place that gives you this instinct. When we maintain the pelvis in the correct position the muscles are held in their optimal position and generate the maximum force. We call this length / tension relationship in the trade. Most cyclists I’ve worked with have looked blankly at me when I’ve uttered the phrase pelvic neutral. Here’s a video to explain more and how you can get in some free extra training in at your desk. Now you’ve got a sense of what is possible with your pelvis. How does this translate to sitting on a bike. Well the answer is with subtlety. The best way I can describe it is as a lift from your core muscles. Not a massive one. Just a little one. Just so you’re not sitting so ‘heavy’ on your saddle. If you’ve done any Pilates or Yoga this will make more sense to you. If you’ve got a turbo trainer just sit on that to start with and ‘tinker’ with what you’re doing with your pelvis. Just sitting to start with. Then when you’ve got a a sense of something that feels good introduce the legs with some pedal movements looking to maintain a more neutral pelvis. The real power in cycling comes from the glutes. For those not in the know that’s your bottom. Specifically gluteus maximus. It’s the muscles that gives the shape to our bottoms. It pushes the leg backwards or down from a bent up position. In other words pressing down on your pedal. Pretty damn important on a bike. Most cyclists suffer from a very tight bottom. 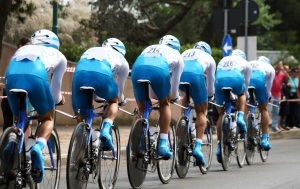 This is because they ride for long periods challenging the muscular endurance of the glutes. When they get overworked, or you don’t have enough of a break between rides to enable them to recover, they will tighten up. This leads to a loss of function / performance and the body will start to look to compensate. Here’s a stretch I recommend to all cyclists pre and post ride to freshen up those glutes. Hold for 30 seconds as a minimum. Ideally over a minute. It will feel good. If a little tight! For those of you that are doing glute stretches already. Great. If it’s this one great. If it’s not that’s fine too. Just mix it up. Try any kind of glute stretch to affect all muscle fibres in your glutes. It’s a big old muscle after all. Of course you’ll be training your glutes loads by simply cycling. But lets try some cross training and challenge them in a different way. Cycling very much trains their endurance. Lets look to increase their strength so they generate more power so you can push a higher gear. As seems traditional I’ve talked my way into a video I’ve not done yet! It’s on the list. If you’d like to be notified when new videos are added to our channel you can subscribe here. In the meantime here’s a decent explanation of what we’re trying to achieve. Having watched this video personally I like to push the pelvis a little higher than shown here and really squeeze your bum cheeks together at the top. You can move up and down and do repetitions. Or you can do squeeze and hold for a time period. I recommend mixing it up and doing a bit of both. These 2 exercises will help loosen those hamstrings better than any hamstring stretch in my experience. They will also help anyone struggling with IT Band issues. It will release your IT Band better than a lemon juicer or wooden spoon as some of my cycling clients have attempted! If you don’t know what an IT Band is it probably means yours is ok.
5. Cyclists Were Not Meant For Ballet! With very few exceptions cyclists have shockingly tight hamstring. This is because when the glute gets tired of pushing the leg backwards the hamstring is first choice to help compensate. Technically it should assist in this movement anyway but when the glute gets tired it does more work and then itself gets tired and tight. So for the underlying fix the exercises above are more important. However, this stretch is great for some symptomatic relief. Speaking of symptoms… issues within the hamstring are obvious. You feel them in the hamstring. Less obvious maybe issues in and around the knee which this stretch can help with. I don’t know about you but when I cycle my quads ache. It could be that I’m not a very accomplished cyclist. It could be that my quads are very dominant. I’m not alone in this. We see a lot of cyclists with the same quad dominance. This could be you if your quad muscles are disproportionately sized to the rest of you! As with hamstrings this stretch can positively impact symptoms in and around the knee. Finally I’ve got this post out there. It’s been brewing for many years. I hope all you cycling folk find it useful. I’d love to here your thoughts so please comment below. If you like it please share with all your cycling chums using the sharing buttons below. If you’re just broken or you just want some short cuts to get you back on your bike better after injury. Then you know where we are. In the meantime let’s focus on who out of the tour can last the distance! Foam Rolling Hell! Is It Worth The Agony? Can X-Ray Or MRI Hinder Your Physio Treatment? 4 Easy Gravity Defying Physio Stretches To Stay Young!